Last Flight Out by the Billy Graham Association is a movie about the power of forgiveness and the strength of God’s love. Much of the movie takes place in a village where a pilot is sent to distribute much needed supplies to the missionaries. While the village is harassed by gangs in the area, the pilot finds the commitment of the missionary staff to be both intriguing and puzzling at the same time. Why are the missionaries unafraid in spite of the circumstances? 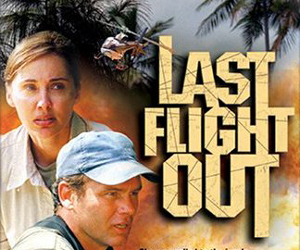 The pilot in Last Flight Out analyzes the situation and tries to convince the missionaries to flee for their lives. It is through some of these toughest times that the pilot learns the power of God’s watchful eye over his flock. Last Flight Out is an excellent movie to share with unsaved and saved friends and family. It is filled with suspense and drama and is suitable for people of all ages.